In 2018 the Emerging Voices for Global Health (EV4GH) venture has entered into its sixth edition. It is a multi-partner blended training programme which, this year was a shared effort between the Institute of Tropical Medicine Antwerp, Institute of Public Health in Bangalore, Peking University Health Science Center, the University of Western Cape and the Liverpool School of Tropical Medicine. The training programme coaches “Emerging Voices” to actively participate in international conferences where global health issues are addressed and to raise their voice in scientific and policy debates. After eight weeks of distance coaching, the EV face-to-face training programme finally kicked off on 28 September, 2018 with a bunch of icebreaking activities so that everybody from this cohort got to know each other a bit better. Unfortunately, and widely reported in the media, there were more visa rejections this year, no doubt due to this year’s location (UK), so not everybody from the selected 38 EVs could be with us in Liverpool. The EV4GH venture is already for a while a multi-partner event, with IPH Bangalore firmly in the lead (as EV secretariat), together with an EV governance team (with representatives from various WHO regions). ITM remains, as one of the partners, firmly committed to the programme. As was already the case at the previous edition, the programme was largely put together by the secretariat, governance members and EV alumni from various cohorts. During the nine days of an intensive face-to-face training programme, the EVs engaged with their fellow participants, facilitators and leaders from the field of health policy and systems research on the dedicated themes for each day: community health systems (CHS), private sector engagement, global health in the SDG era, leaving no one behind, human resources for health and health systems in the context of fragile and conflict-affected states (FCAS). Each theme had a set of organized “thematic” sessions, including one big talk (this year featuring Margaret Gyapong, Gerry Bloom, Gorik Ooms, Maryam Bigdeli and others), an EV-led session and a thematic working group session. This year, the EV training programme had made a big effort to reach out to other thematic working groups from Health Systems Global (the society and organizing body behind the Global Symposia) and incorporate them in the programme. A key aim of the EV network is to let EVs also engage in other thematic working groups for networking and research purposes, after the symposium. The EV led thematic sessions were a great mix of role plays, fish bowl and innovative panel discussions and debates which already sparked a lot a buzz around the key questions for HSR Symposium. The second big chunk of the training focused on knowledge translation and coaching the EVs on effectively communicating their messages to various target groups through posters, policy briefs, blogs, oral presentations and social media. The training also included a local health systems day, where the EVs visited the governmental and non-governmental organisations that are working towards health for all and got a perspective on the UK health system. The face-to-face training program ended with a pre-conference on 6 October where the participants presented their work and received constructive feedback from global health leaders such as Kabir Sheikh (Health Systems Global) and Sally Theobald (from our co-host Liverpool School of Tropical Medicine). Prashanth NS also gave a warm tribute to former EV governance member Asmat Malik, who sadly passed away last year, but will always be remembered by the EV family. The closing plenary cheered on the EVs’ work and highlighted the critical role this EV network can play in shaping the public health policy discourse. 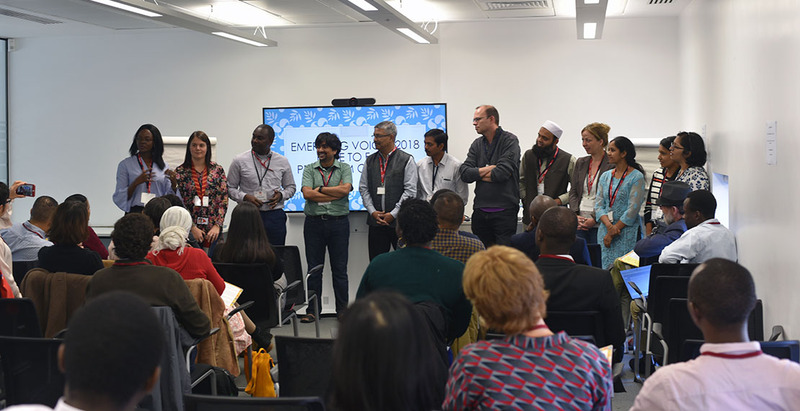 With participation from around 28 countries, the current EV 2018 cohort brought along their diverse experiences to share, that triggered a lot of engaging discussions and conversations to follow throughout the training programme. We already have three blogposts published on the IHP blog from the new cohort, based on various discussions that happened during the EV training. After Liverpool, the next stop for EVs will be Dubai. Preparations are already ongoing for the 2020 venture. The initiative is financed by the Belgian Development Cooperation.